Paul Pogba has re-announced himself among football’s elite after a stellar World Cup campaign. WITH his reputation as one of the world's most talented midfielders on the line after another underwhelming Premier League campaign, Paul Pogba's World Cup was always going to be career-defining. The 25-year-old entered the tournament having only scored six times in all competitions last season, as his role at Manchester United under Jose Mourinho dwindled. But if the man who is, rightly or wrongly, often judged on his impact in attack, then his match-winning moment in the World Cup final will surely restore his standing among football's elite. Paul Pogba scored in France’s World Cup triumph over Croatia on Monday morning. Pogba on Monday morning re-announced himself to the world on its biggest stage; scoring France's third and the contest's most decisive goal to end Croatia's miracle run at the final hurdle. With the World Cup in the balance at 2-1, and with Croatia possessing the majority of the ball, Pogba opened up his opponents in the 59th minute with a sublime pass to teenager Kylian Mbappe from deep within his own half. Displaying his prowess as a true box-to-box midfielder, Pogba rejoined the attack on the edge of the area, where Antoine Griezmann laid the ball off to him. His first-time hit was blocked by a wall of red and white, but his follow-up on his weaker left foot left Croatian goalkeeper Danijel Subasic rooted to the spot. It was just reward for Pogba, who passed well all day and worked tirelessly in the middle of the park to compensate for an uncharacteristically poor N'Golo Kante. 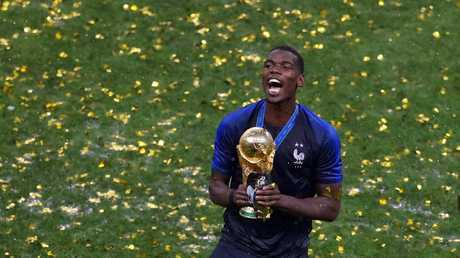 In fact, France coach Didier Deschamps brought out the best in Pogba all tournament, something which United manager Mourinho is yet to achieve with any regularity. Pogba adopted a disciplined role in Russia alongside Kante, playing a pivotal role in his side's attacking transitions through his exceptional vision and passing. His performances for France should put an end to the debate over whether he is a number six or a number ten - the two positions he has been forced to switch between at United. Pogba's efforts should also go a long way to shaking off the wealth of critics he has amassed in recent years, many of which criticise his apparent obsession with building a large social media following. His Snapchat and Instagram accounts were on Monday morning still in full swing in the French rooms, where he said he "had to dab" - a trademark dance move of his, adopted from American hip-hop artists. He did it while holding the World Cup trophy though, so perhaps his critics could forgive the act of showmanship, if not just this once.